Retreat to the forest for a weekend of yoga and nurture your wellbeing! Early bird offer available until end of February of £245. Usual price £265. Are you interested in booking onto one of our weekend retreats? Simply fill out our form here. Have a read of our weekend Itinerary here. Our weekend retreats will be based at Oakraven (click here), a secluded field centre that specialises in eco-forestry and is suitable for guests wishing to come on their own, or with friends/family planning a special weekend away. Accommodation is shared dormitory style, with a unique space to practice yoga and other activities. 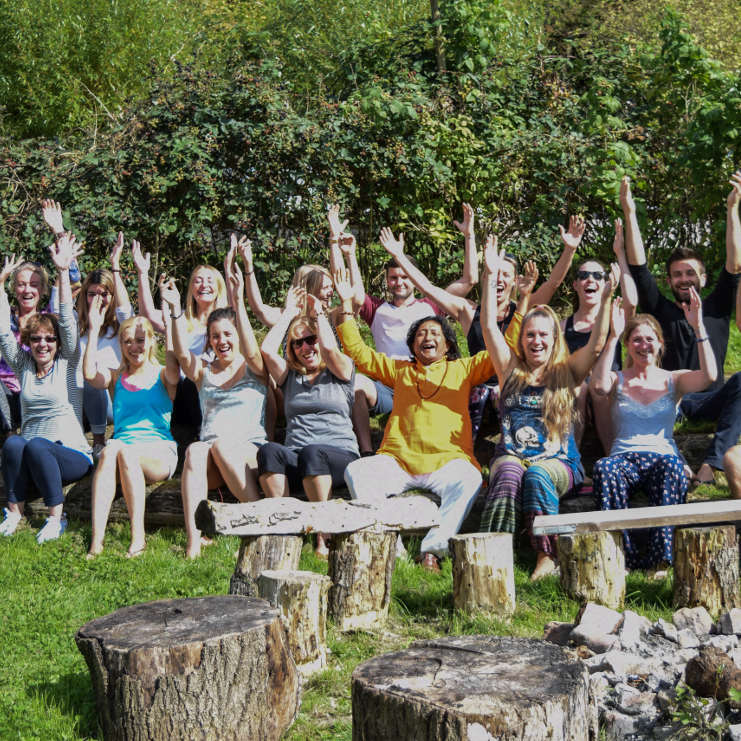 Take time out for yoga and meditation, exploring the tranquil outdoor space, eating delicious nourishing food and connecting with likeminded yogi’s. The weekend’s yoga is most suited to beginners and intermediates. More advanced yoga retreats are also available upon request. The morning’s yoga on this retreat is dynamic, with a more restorative session in the afternoon and evenings. • An opening and closing circle – helping you feel safe and build trust. • A walk in the Forest of Dean to St Anthony’s Well: A Sacred Spring dating back to Pre-historic age which has had ritual significance for thousands of years, with claimed efficacy to resolving ailments such as arthritis. You are welcome to take a dip in this sacred water! • Wholesome vegetarian meals with plenty of snacks and refreshments. The delicious food prepared by Tom who is a trained cook with 20 years experience. We cater for all dietary requirements and you won’t miss out on anything! • Saturday afternoons workshop will be focused on learning about the Chakra System – our seven centres of spiritual power. Learn how to activate them to lead a more balanced meaningful life. • Move your body and set yourself free with a soul dancing. • Evenings spent sitting around a warm fire in stimulating conversation with fellow yogi’s. • Optional holistic treatments including an Ayuvedic and Swedish Massage, Indian Head Massage and Reiki. • Clean and warm bunkhouse style accommodation. • SPECIAL SATURDAY NIGHT SOUND HEALING BATH – can only be described as a soothing, detoxing, rejuvinating vibrational sound massage for the body and mind too! If you have any questions, do not hesitate to call Hayley on 07826-557211 or Ildy on 07552-442963. Also contactable via email: yogawellnessretreatsuk@gmail.com.